– Creamy Cajun Chicken Pasta – which we had with whole wheat bowtie pasta. No one was very impressed – it wasn’t creamy and it certainly wasn’t Cajun. Just tasted like chicken spaghetti. Oh, the kids ate this pretty well, but they usually eat any kind of spaghetti. – Baked Lump Crab Cakes with Red Pepper Chipotle Lime Sauce – I don’t think I ever met a crab dish that I didn’t lik – Wade said it would have been better with some Cajun seasoning and I agree, but I also liked it as it was. I just ate one for lunch that I had leftover, very yummy! Not a favorite of the kids, but we can’t usually get them to eat crab anyway. – Beef and Bean Chile Verde – this was a pretty good dish which we ate with tortilla chips but agreed it would be great in crunchy tacos. Emelyn ate it up, she loved it, even though it was a little spicy. We topped it with cheese and cilantro and I smashed up the beans in my own and in Emelyns. Very yummy! 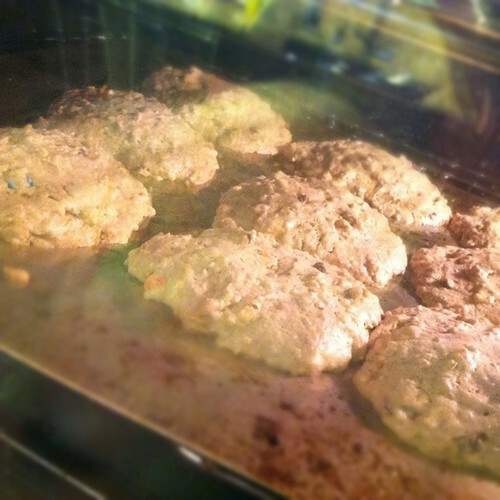 And that was it for the week, unless you want to count the Monster Cookies we made today! Emelyn and I have been doing Mommy School, which I found through Pinterest (if you aren’t on Pinterest yet, you must join NOW!) I’m not sure if they just weren’t mixed well (after they were in the oven, I transferred the rest of the batter from the mixer to a ziplock and there were large areas where you could tell it hadn’t mixed too well) or if they just aren’t that good, but they were just OK. I’m not sure if the kids will like them, Em didn’t eat hers and Hayden hasn’t tried yet. They were just kind of bland, despite having peanut butter, chocolate chips AND MMs in them!